We cling to bad relationships for any number of reasons. Sometimes we assume the time we have invested in a destructive relationship is too substantial to relinquish. But that is merely grief distorting our reason. The loss of a year — or a decade — does not justify the loss of another. Sometimes we believe the passion we feel — unreciprocated as it may be — is the only thing that gives our lives significance. But that is false. Our lives derive significance (and joy) from many sources: faith, nature, children, family, friends, work, charity, and creativity to name a few. Ultimately, what gives our lives meaning is the fact that we are children of God, made in His image. Nothing and no one can deprive us of that attribute…though it is all too easy to forget, when we have been subjected to abuse. This is a helpful article laying out 7 steps for victims to follow, if an abusive ex-lover or spouse still has an emotional hold on them. “Train up a child in the way he should go; even when he is old he will not depart from it” (Prov. 22: 6). The Amazingly Authentic Confidence Program at Grambling State University helps grow the self-esteem of girls between the ages of 5 and 19 . Girls in this age range are considered most vulnerable. The program goes to some unusual lengths. Five year old Jourenii Johnson was recently given the chance to teach a group of college students. With total confidence, the little girl – who wants one day to become a teacher – informed the class that bullying is not a good thing. She, also, instructed students not to use their cell phones in class. Kudos to Grambling State! How beautiful it is to see our children nurtured! One cannot help but think of all those who do not receive the care they deserve. For their sake, we must keep striving: to educate the public about abuse; to rescue those being abused; to prosecute predators; and to set firm safeguards in place to prevent future abuse. There was a child born 2000 years ago who brought hope and love into this broken world. His desire for us is that we live joyfully; that we see ourselves as precious children of the One True God, and raise our own children in peace. KNOE News 8, “5-year-old teaches at Grambling State University” by Kaitlyn Loyacano, 11/14/16, Updated 11/15/16, http://www.knoe.com/content/news/5-year-old-teaches-at-Grambling-State-University-401188286.html. 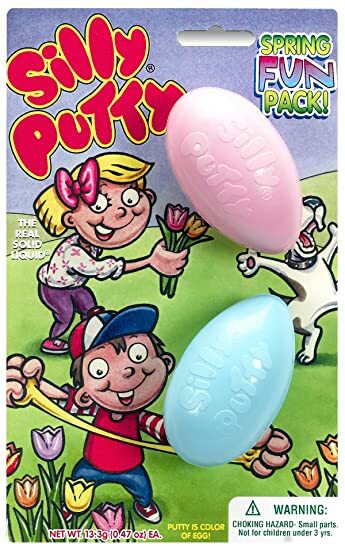 Most of us remember Silly Putty from childhood. A silicone-based toy, Silly Putty (trademarked by Crayola) could stretch, bounce, and replicate print images like those found in newspapers or comic books (today’s “graphic novels”). Once removed from its protective shell, Silly Putty could be twisted and folded into a variety of shapes, and the images captured on it comically distorted. These properties still astound and delight children. But to abuse victims, Silly Putty offers a caution. All human beings – abuse victims included – need validation, confirmation that their thoughts and feelings are appropriate, and in line with reality. The need is part of what makes us human. However stoic we may imagine ourselves, we were engineered for connection to others. When we are denied connection through abuse, our need for validation does not disappear. It intensifies. Anxious to please, we may become putty in the hands of friends and family – willing to conform to their standards, to turn ourselves inside out, even if not asked to do that. It can become difficult for us to remember what we might have preferred, if our loved ones had not expressed a preference first. The quality of our loved ones will be tested, in the process . Most of us seek to comply with the desires of friends and family. Maintaining harmony in our relationships is a laudable goal. Generally, it is not a great deal to ask that we pursue the same course of action our loved ones do. Affection will often sway us, especially if the choice is not of any great significance. There are healthy coping strategies for dealing with anxiety. Routines, such as taking a daily walk or reading at lunch, can be helpful in alleviating anxiety. Scheduling time to decompress from the worries of the day can, also, help. This should be away from cell phones and other distractions. Exercise is a natural de-stressor. Sleep hygiene can be important, since restful sleep enables us to recharge our mental batteries. This should involve regular times to turn in at night and arise mornings, along with a bedtime routine which encourages relaxation. Video games should be avoided just before bed. Phobias are often reduced in severity using behavior modification (specifically “desensitization” therapy). This involves repeated exposure to the fear-producing stimulus under safe conditions. Talk therapy has, also, been found to be helpful, especially with social anxiety . Biofeedback, which involves controlled breathing and other techniques, may be useful in reducing anxiety. Numerous medications exist today to treat anxiety, including serotonin-specific re-uptake inhibitors (SSRIs) and anti-depressants . A knowledgeable psychiatrist should be consulted about these. Meditation and, of course, prayer can provide relief. “Do not remember the former things, Nor consider the things of old. Behold, I will do a new thing, Now it shall spring forth; Shall you not know it? I will even make a road in the wilderness And rivers in the desert” (Isaiah 43: 18-19). “Therefore, if anyone is in Christ, he is a new creation; old things have passed away; behold, all things have become new” (2 Cor. 5: 17). “ ‘Therefore I say to you, do not worry about your life, what you will eat or what you will drink; nor about your body, what you will put on. Is not life more than food and the body more than clothing? Look at the birds of the air, for they neither sow nor reap nor gather into barns; yet your heavenly Father feeds them. Are you not of more value than they?’ ” (Matt. 6: 25-26). “For God so loved the world that He gave His only begotten Son, that whoever believes in Him should not perish but have everlasting life” (John 3: 16). “There are diversities of gifts, but the same Spirit. There are differences of ministries, but the same Lord. And there are diversities of activities, but it is the same God who works all in all” (1 Cor. 12: 4-6). “ ‘What man of you, having a hundred sheep, if he loses one of them, does not leave the ninety-nine in the wilderness, and go after the one which is lost until he finds it?’ ” (Luke 15: 4). “In all your ways acknowledge Him, and He shall direct your paths” (Ps. 3: 6). “Be strong and of good courage, do not fear nor be afraid of them; for the Lord your God, He is the One who goes with you. He will not leave you nor forsake you” (Deut. 31: 6). “ ‘…and lo, I am with you always, even to the end of the age’ ” (Matt. 28: 20). HelpGuide, “Therapy for Anxiety Disorders” by Melinda Smith, MA, Robert Segal, MA, and Jeanne Segal, PhD, last updated 10/16, http://www.helpguide.org/articles/anxiety/therapy-for-anxiety-disorders.htm. In my view, faith and medicine are not at odds. Medicine is a general blessing by God to mankind. The miraculous cures by Christ were intended as a sign that He was the Messiah, not as a rejection of medicine. Christ, Himself, referred to medicine, in response to the Pharisees. He is quoted as saying, “Those who are well have no need of a physician, but those who are sick” (Matt. 9: 12). Soup spoon, Author Donovan Govan (CC BY-SA-3.0 Unportedl GFDL). “Though I speak with the tongues of men and of angels, but have not love, I have become sounding brass or a clanging cymbal” (1 Cor. 13: 1). Whether as abuse victims made the object of unfair comparisons or as men and women raised in a materialistic culture, we have a tendency to compare ourselves to others. The comparison nearly always overlooks our real gifts. Not many of us are fashion models or world class chefs. Few are sports icons, movie stars, or billionaires. None at all can stay eighteen forever. We play different parts, in the course of a lifetime – some more humble than others, but no less important. Spoons may be less glamorous than swords or scepters. But they fill an essential role. 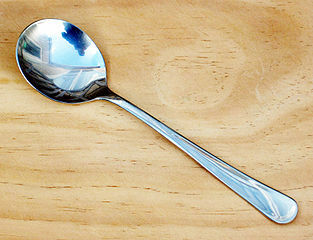 You cannot scoop pudding for a child with a saber, or feed the hungry of the world with a magic wand. Ask any farmer. Love, above all else, is what the world needs. Not “love” as portrayed by Hollywood. Real love – the kind that takes sweat and sacrifice. The kind that involves wiping noses and kissing boo-boos; standing on an assembly line, day in and day out, to make sure the bills get paid. If we can manage that without having known it ourselves, we have achieved something close to miraculous. Shrapnel wounds require special care. Initially, these are open puncture wounds, with impaled objects so hot that medical personnel are strictly advised to leave them in place. Pressure on shrapnel wounds must be avoided, as this will only cause more damage to surrounding tissues and organs. After it cools, some shrapnel can be removed surgically . Often, however, surgery would do more harm than good. There may be hundreds or thousands of small objects. Over the years, fragments left behind can migrate within the body, making them still harder to find and access. It is not unusual for shrapnel to remain imbedded for decades . The same is true for trauma beliefs. When children undergo trauma, they experience strong emotions. Like scorching metal fragments, these searing emotions highlight the traumatic event. But children, also, draw conclusions from trauma. This is their attempt to make sense of the world. Unfortunately, the conclusions children draw may not be accurate . Since the traumatic event is not fully understood, the child cannot fully process it. Instead, the emotions and faulty conclusions surrounding the trauma remain sharp, jagged, and are re-experienced, again and again. This happens even after conscious memory of the event has faded. Like shrapnel, trauma beliefs remain in the body, and continue to do harm. Having been abandoned as children, we may fear that others will leave us as adults. Having been abused as children, we may believe ourselves unworthy of love as adults. These core beliefs about ourselves and the world around us may never be vocalized, never questioned. But they are deeply held.